Marine Le Pen's pledge to ditch the euro if elected French president would cost the country over €30 billion a year in increased borrowing costs, the country's central bank governor warned today. There is now less than three months to go before the first round of the French election. Le Pen is polling strongly on a nationalist platform of heavily curtailing migration, relinquishing the euro and organising a referendum on France's EU membership. Banque de France governor Francois Villeroy de Galhau said that pulling out of the single currency would drive up the cost of France's borrowing. "If we were alone, we would be helpless faced with financial market speculation... and helpless faced with US pressure on the dollar," he told France Inter radio. "Financing France's public debt would cost over €30 billion a year - that's the equivalent of France's annual defence budget," he said. Villeroy de Galhau did not give a breakdown of the calculation but said the interest on France's debt had fallen by 1.5% since it adopted the single currency. "That is very significant for those with home loans, for business investments and all taxpayers," he said. He also credited the euro with keeping inflation down, causing it to fall from nearly 5% annually before the 1992 Maastricht Treaty that ushered in the euro to under 2%. Le Pen has argued that France needs to take back control over its monetary policy to boost growth - forecast to come in at 1.3% in 2017, below a euro zone average of 1.7% - and rein in unemployment. 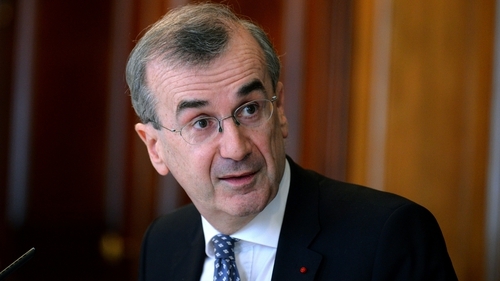 Villeroy de Galhau acknowledged that the French economy needed to be "repaired and refurbished" but rejected the notion that the euro was the cause of its malaise. "Many countries that share the euro with us are doing well on the economic front," he said, warning against "tearing down the foundations, our currency the euro, which forms a very strong basis in uncertain times."